This article first appeared in The Love Issue, our June/July edition of Marketing magazine. 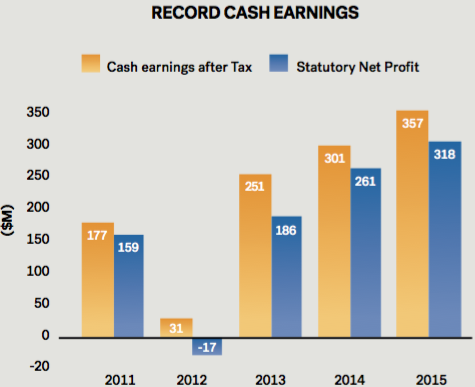 The year 2013 was a watershed moment for BOQ. Having posted a 2012 loss of $17.1 million in a pensive post-GFC climate, the market conditions faced by the bank had never been tougher. As a small challenger brand in one of the biggest spending categories (less than 2% share of voice against the ‘Big Four’), BOQ needed to reposition the brand. One thing BOQ did have in its favour was very ‘unbank’-like levels of advocacy among existing customers. In a category where recommendation from family and friends is the biggest driver of choice, leveraging this unique relationship proposition was key to turning around the fortunes of the bank. The marketing team knew BOQ’s people, at their best, delivered a relationship that was very different and compelling in the marketplace. But they needed to inspire more of the organisation to deliver on this, more often. the marketing team had to engage owner/managers and convince reluctant stakeholders to get on board with the idea. The BOQ team developed a dashboard to track the campaign performance. The team identified a range of key metrics to ensure the organisation was successful. These metrics included advocacy (Net Promoter Score), sales (focus on new ‘customer centric’ products such as the Clear Path Home Loan) and engagement metrics (staff engagement scores, website and customer contact centre traffic, social media engagement). These metrics were tracked and communicated, wherever possible, in real time, so the organisation could constantly track progress towards its goal. When it came to a new brand positioning for BOQ, the team needed an idea that rallied the organisation from the inside out. Key to a great ‘organising idea’ is its authenticity – it needs to be a reflection of a brand purpose that everyone in the organisation believes in. The team started conducting a series of stakeholder interviews with workers at every level, from the executive team and human resources to branch managers and tellers, to understand what they believed made BOQ different and why they had chosen to join the company. Interestingly, many staff had joined BOQ after successful careers at one of the Big Four banks. Why? Nearly all said it was because at BOQ they felt empowered to put the customer first. The answer was simple: to bring human relationships back into banking. In a category defined more by the latest mobile or tablet app, BOQ was offering something fresh and compelling. These internal insights, matched with the feedback from customers, led to a new organising idea for BOQ: ‘It’s possible to love a bank. Let us prove it.’ Much more than advertising, this new positioning served as a rally cry for staff, as well as an invitation for customers. the branch network to do a lot of the heavy lifting, with local area marketing being a particularly important channel. Branch staff needed to be highly engaged. The marketing team used a combination of local area marketing portals to provide branch staff with ideas and collateral for ‘proving it’s possible to love a bank’. Funds were made available for staff to proactively come up with their own ideas to promote the brand or a product in a ‘lovable’ way. The best ideas were rewarded with either full funding or matched funding to bring the idea to life. The most important part of proving ‘it’s possible to love a bank’ was internal engagement. 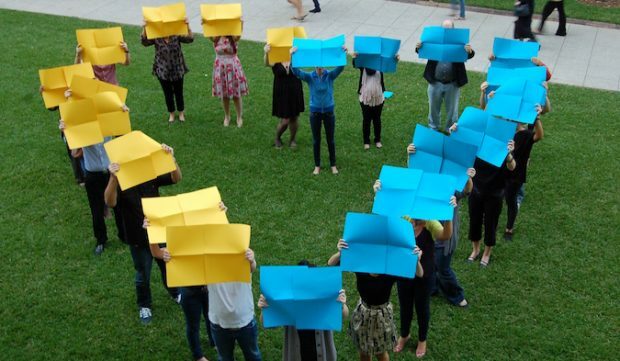 Working very closely with corporate affairs and human resources, the team began to ‘operationalise love’ at BOQ. BOQ updated its corporate vision to be ‘the most loved bank in Australia’, sending a clear message of the bank’s ambition from the top down. Then-CEO, Stuart Grimshaw commenced a national roadshow to sell the new vision internally across the organisation. At the same time, he held a press conference with key consumer and trade media. A distinct new identity was developed for the bank, designed to get cut-through while also being a reflection of the genuine warmth and friendliness of the people at BOQ. As part of the process, the BOQ marketing team, in partnership with creative advertising agency BWM Dentsu, produced more than 150 illustrations of key staff in the look and feel of the new campaign creative that they were empowered to use in their own marketing efforts, helping to give them a sense of ownership. Internally, the team created the ‘Love your work’ staff awards, ‘Love your Customer’ data capture forms and ‘Love Mail’, where staff celebrate exceptional instances of going ‘above and beyond’ for internal or external customers. Branch staff were encouraged to deliver ‘Random acts of kindness’ for customers whenever and wherever the opportunity arose, such as shouting everyone a coffee. In July 2014, the first BOQ ‘icon’ branch was opened in Macquarie Centre, Sydney. Unlike traditional bank branches there are no tellers. Rather, icon branches are spacious and customers can approach staff at open-plan benches. BOQ also made over its staff uniform to better reflect the personality of the brand. In July 2015, the new BOQStyle collection, designed in collaboration with cult Australian label Aje, was unveiled. The pieces were specifically created to allow BOQ staff to express their individuality and style while still looking like a cohesive unit. Since the launch of the new brand positioning in June 2013, internal marketing has been leveraged to deliver a remarkable turnaround for the business. The company-wide engagement with ‘It’s possible to love a bank’ has been at the heart of BOQ’s success. A key outcome of the campaign was the transformation in how the owner/managers engaged with marketing at BOQ. From 2014 to 2015 alone, the staff engagement score increased from 43% to 67%. The ongoing upward trend in network and owner/ manager engagement is illustrative of a constantly improving work culture, at the heart of which is the new brand positioning. 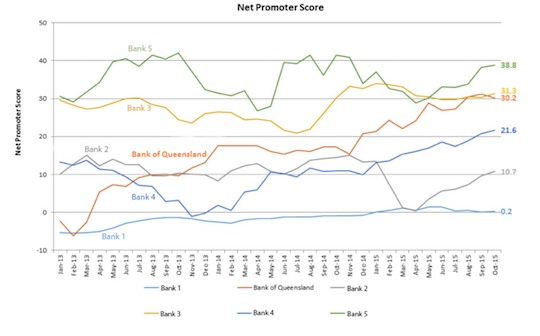 BOQ is ranked highly in the banking category for advocacy, with a marked increase occurring since the repositioning of the brand. This indicates staff are delivering exceptional service that is worth talking about. An inside-out, internal marketing approach to rebuilding the organisation has helped drive profitable results over the last three years. The new brand positioning and the successful marketing of this positioning internally has been key to keeping the business engaged and focused on the end game of making a profit and being the ‘most loved bank in Australia’. 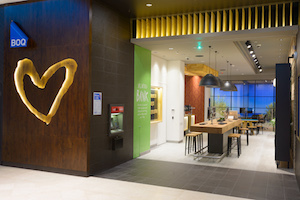 In two short years, ‘It’s possible to love a bank’ has influenced everything BOQ does, from board meetings, to new Icon branches, to hiring policies, to staff awards. Everything is designed to show both internally and externally that BOQ is determined to deliver a very ‘unbank’-like relationship and prove it’s possible to love a bank. The project won the 2015 AMI Award For Marketing Excellence in the Internal Marketing category.